Supplementary objectives of the Nanook expedition (a smaller equivalent conducted off eastern Greenland). The Western Group of ships reached the Marquesas Islands on December 12, 1946, whereupon the Henderson and Cacapon set up weather monitoring stations. By December 24, the Currituck had begun launching aircraft on reconnaissance missions. The Eastern Group of ships reached Peter I Island in late December 1946. On January 1, 1947, Lieutenant Commander Thompson and Chief Petty Officer Dixon utilized "Jack Browne" masks and DESCO Oxygen rebreathers to log the first dive by Americans under the Antarctic. Paul Allman Siple, Ph.D. was the senior U.S. War Department representative on the expedition. Dr. Siple was the same Eagle Scout who accompanied Admiral Byrd on the previous Byrd Antarctic expeditions. The Central Group of ships reached the Bay of Whales on January 15, 1947, where they began construction of Little America IV. Naval ships and personnel were withdrawn back to the United States in late February 1947, and the expedition was terminated due to the early approach of winter and worsening weather conditions. After the operation ended, a follow-up Operation Windmill returned to the area in order to provide ground-truthing to the aerial photography of Highjump from 1947-1948. Finn Ronne also financed a private operation to the same territory until 1948. As with other U.S. Antarctic expeditions, interested persons were allowed to send letters with enclosed envelopes to the base, where commemorative cachets were added to their enclosures, which were then returned to the senders. These souvenir philatelic covers are readily available at low cost. It is estimated that at least 150,000 such envelopes were produced, though their final number may be considerably higher. On December 30, 1946, aviation radiomen Wendell K. Hendersin, Fredrick W. Williams, and Ensign Maxwell A. Lopez were killed when their Martin PBM Mariner George 1 crashed during a blizzard. The surviving six crew members were rescued 13 days later, including aviation radioman James H. Robbins and co-pilot William Kearns. A plaque honoring the three killed crewmen was later erected at the McMurdo Station research base, and Mount Lopez on Thurston Island was named in honor of killed airman Maxwell A. Lopez. In December 2004, an attempt was made to locate the remains of the plane. There are ongoing efforts to repatriate the bodies of the three men killed in the crash. On January 21, 1947, Vance N. Woodall died during a "ship unloading accident". In a crew profile, deckman Edward Beardsley described his worst memory as "when Seaman Vance Woodall died on the Ross Ice Shelf under a piece of roller equipment designed to 'pave' the ice to build an airstrip." The documentary about the expedition The Secret Land was filmed entirely by military photographers (both USN and US Army) and narrated by actors Robert Taylor, Robert Montgomery, and Van Heflin. It features Chief of Naval Operations Fleet Admiral Chester W. Nimitz in a scene where he is discussing Operation Highjump with admirals Byrd and Cruzen. The film re-enacted scenes of critical events, such as shipboard damage control and Admiral Byrd throwing items out of an airplane to lighten it to avoid crashing into a mountain. It won the 1948 Academy Award for Best Documentary Feature. ^ a b Kearns, David A. (2005). "Operation Highjump: Task Force 68". Where Hell Freezes Over: A Story of Amazing Bravery and Survival. New York: Thomas Dunne Books. ISBN 0-312-34205-5. ^ a b Bertrand, Kenneth John (1971). Americans in Antarctica 1775-1948. New York: American Geographical Society. p. 485. ^ Dubill, Andy (December 2008). "Paul Siple". International Scouting Collector's Association Journal. International Scouting Collector's Association. 8 (4): 45–46. ^ a b "Operation Highjump: The Great Antarctic Expedition". South-Pole. Retrieved 5 March 2018. ^ "Ronne Antarctic Research Expedition". Ronne Antarctic Explorers. Retrieved 5 March 2018. ^ "Operation Highjump: A Philatelic Introduction". South Pole. Retrieved 5 March 2018. ^ "The Byrd Memorial at McMurdo". South Pole Station. Retrieved 5 March 2018. ^ "News Archives from Antarctica". Antarctic Connection. 2004. Archived from the original on 2006-01-12. ^ "Operation Highjump Crew Recovery". George1Recovery.org. ^ "The Secret Land" – via www.imdb.com. ^ "Academy Award for Best Documentary Feature". IMDb. This article incorporates public domain material from websites or documents of the United States Coast Guard. Colin, Summerhayes; Beeching, Peter (2007). "Hitler's Antarctic base: the myth and the reality". Polar Record. 43 (1): 1. doi:10.1017/S003224740600578X. Navy Proudly Ends Its Antarctic Mission; Air National Guard Assumes 160-Year Task. Chicago Tribune; February 22, 1998. "Declassified Records on Operation Highjump". The Black Vault. The Amundsen Sea, an arm of the Southern Ocean off Marie Byrd Land in western Antarctica, lies between Cape Flying Fish to the east and Cape Dart on Siple Island to the west. Cape Flying Fish marks the boundary between the Amundsen Sea and the Bellingshausen Sea. West of Cape Dart there is no named marginal sea of the Southern Ocean between the Amundsen and Ross Seas. The Norwegian expedition of 1928–1929 under Captain Nils Larsen named the body of water for the Norwegian polar explorer Roald Amundsen while exploring this area in February 1929. The United States Antarctic Expedition Medal is a combined military-civilian award that was authorized by the United States Congress on September 24, 1945 under Public Law 185 of the 79th Congress. The award recognizes members of the United States Antarctic Expedition of 1939–1941. There were gold, silver, and bronze versions. It is unclear if the gold version is considered a Congressional Gold Medal, as was the case with the 1st Byrd expedition. Little America was a series of Antarctic exploration bases from 1929 to 1958, located on the Ross Ice Shelf, south of the Bay of Whales. Marie Byrd Land is the portion of West Antarctica lying east of the Ross Ice Shelf and the Ross Sea and south of the Pacific Ocean, extending eastward approximately to a line between the head of the Ross Ice Shelf and Eights Coast. It stretches between 158°W and 103°24'W. The inclusion of the area between the Rockefeller Plateau and Eights Coast is based upon the leading role of the American Rear Admiral Richard E. Byrd in the exploration of this area. The name was originally applied by Admiral Byrd in 1929, in honor of his wife, to the northwestern part of the area, the part that was explored in that year. 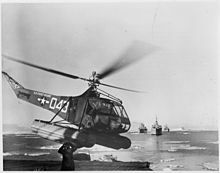 Operation Windmill (OpWml) was the United States Navy's Second Antarctica Developments Project, an exploration and training mission to Antarctica in 1947–1948. This operation was a follow up to the First Antarctica Development Project known as Operation Highjump. 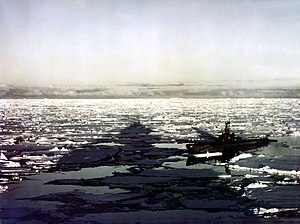 The expedition was commanded by Commander Gerald L. Ketchum, USN, and the flagship of Task Force 39 was the icebreaker USS Burton Island. Rear Admiral Gerald L. Ketchum was a career officer in the United States Navy. He served during World War II and the Korean War. He was a recipient of the Silver Star and also participated in four expeditions to Antarctica. The Secret Land is a 1948 American documentary film about a United States Navy expedition code-named "Operation Highjump" to explore Antarctica and to evaluate its potential for military operations in 1946. It won the Oscar for Best Documentary Feature.